The Team at Red Circle Solar are awesome. If you want a quality product with expert knowledge on solar installation you’’l be more than happy with their skills. Prompt response and happy to discuss options and answer your questions. I’d definitely use them again. a back up that is barley used as the system is also heated by the wood fire. After installing my Red Circle Solar hot water system I use about 8 less x 45KG bottles of LPG per year! Seriously. The system paid for itself in just 3-4 years! We exist because there are smarter ways to heat water! Save up to 80% of your hot water heating costs. If you would like to save money and lessen your impact, contact us now to talk to a technical expert. NEW PRODUCTS! 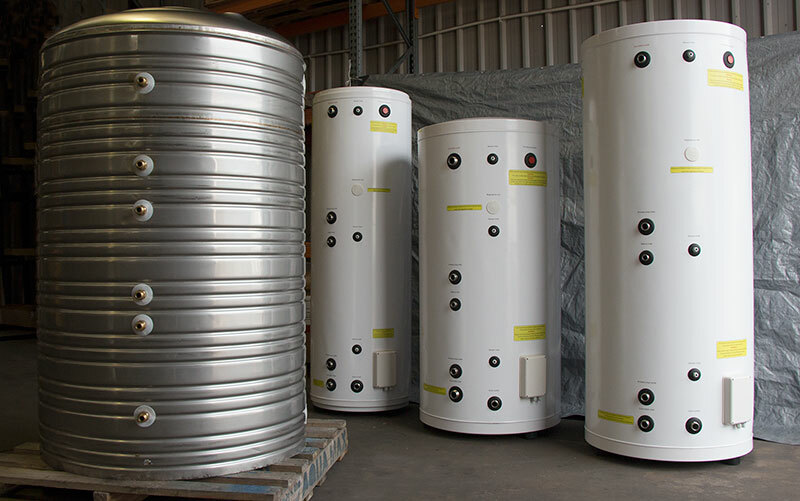 PREMIUM RANGE OF EXEGI DUPLEX STAINLESS STEEL TANKS NOW AVAILABLE. At Red Circle Solar, we sell high quality solar hot water systems through a specialist distributor network at competitive prices. We aim to make the whole process as easy and as flawless as possible, providing training, consultationand support to both the distributor network and the retail consumer. Solar hot water is our specialty Red Circle Solar designs and imports evacuated tube solar hot water systems and solar hot water accessories that are cost effective and versatile, suiting almost any application. 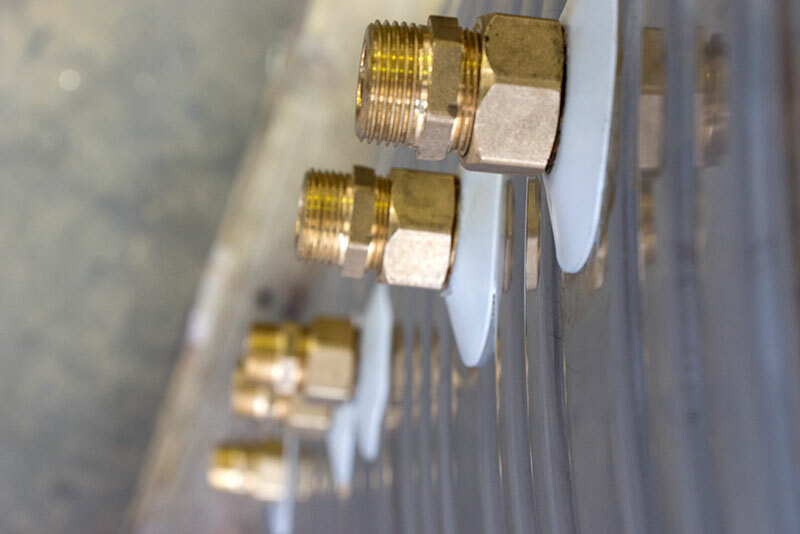 We specialise in stainless steel close coupled systems; Duplex stainless steel split systems; energy efficient water heaters and CO2 heat pumps, so no matter what your solar hot water requirements are, we can tailor a package that will suit your needs. Close coupled solar hot water: The tank and evacuated tubes are both on the roof and the heat from the evacuated tubes thermosyphons into the tank, removing the need for a circulation pump. 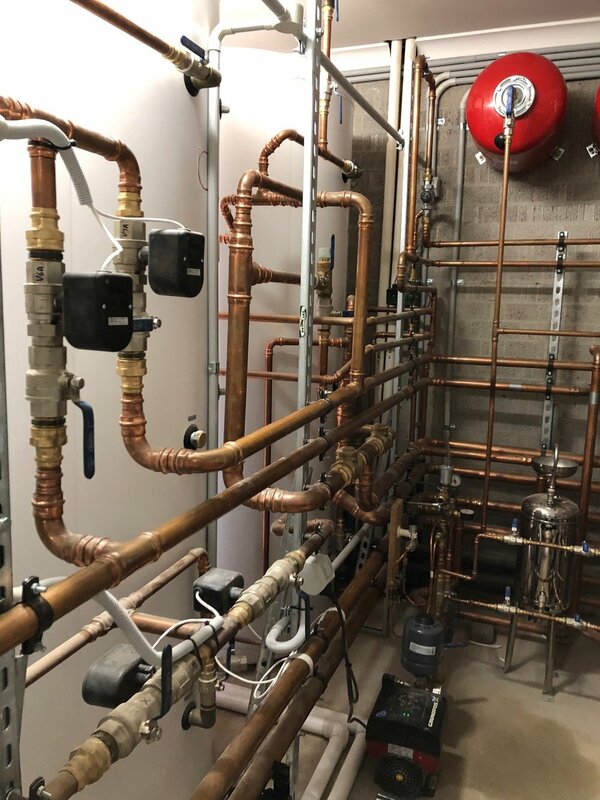 Combining a low-pressure tank with a mains pressure domestic water supply, this style of system is easy to connect to a wood fire without compromising on water pressure. The 30-meter copper heat exchange coil operates at mains pressure, and extracts the heat from the tank as it is being used. The lack of moving parts in the design makes this our most cost effective solar hot water system. Split system solar hot water: The solar hot water storage tank is on the ground and the evacuated tube solar collector is on the roof. The heat from the solar collector is pumped back to the tank, which is controlled and can be boosted by an electric element, gas booster or used as a pre heat to existing hot water systems. Our split system tanks are made from 2205 Duplex stainless steel and come in sizes ranging from 200ltr -500ltr. Sanden heat pumps (C02). Red Circle Solar is a loyal dealer of Sanden Heat Pumps-energy efficient water heaters for Melbourne and the sorrounding areas. With a COP (coefficient of performance) of 5, the Sanden Heat Pump is the most efficient heat pump available in Australia, using only 900 watts to generate 4500 watts of heat! Magic? Almost, but no. 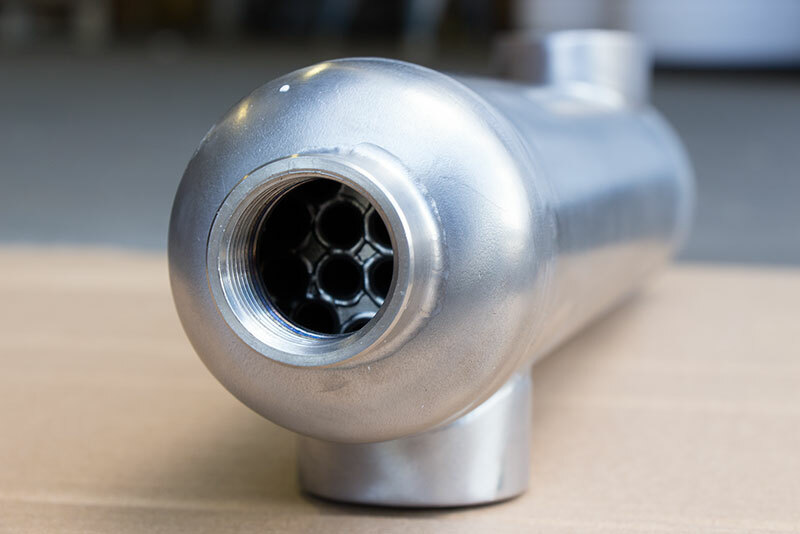 The efficiency comes from the use of a compressor that takes the ambient heat from air, and passes through a CO2 heat exchanger, which compresses the CO2 gas. As the pressure of the gas goes up, the temperature of the gas increases. The heat is then transferred to the water stored in the tank ready for use in the home or business. Perfect for coupling with an existing PV solar power system. Solar hot water accessories: Red Circle Solar also sells many other solar hot water products, including titanium heat exchangers; evacuated tube solar collectors; pumps; controllers; hydronic buffer tanks; and solar specific instantaniuos gas boosters. Wood fire boosted solar hot water: Red Circle Solar specialises in wood fire boosted hot water. It is possible to use a wood fire and solar hot water to provide 100% of your hot water needs without any electric or gas boosting. We also sell hydroninc buffer tanks that have heat exchange coils so you can combine hydronic heating with domestic hot water. Please look through our website and contact us if you need any further information or a formal quotation. A great solar heating system can help you to save significant amounts of money over the course of the year while also reducing your environmental footprint: two reasons to feel great! The technology behind solar water heating systems has come a long way in recent years, and it’s now a viable way to heat up the water that you use in your home. There are a range of packages available, meaning that you can find the best solar hot water system for your needs. If you are looking to invest in a solar water system, then you should find a provider that suits your needs. Here’s a closer look at why Red Circle Solar provides solar hot water systems Melbourne residents can rely on for years to come. Over the last seven years, we have worked to develop our solution that makes solar-heated water available to as many people as possible. Bringing together quality, efficiency and affordability, we offer a wide range of solutions to our customers. Whether you’re looking for a split solar hot water system, a close coupled solar hot water system or a range of other pumps and accessories, we have everything that you could possibly need. Furthermore, our experts are happy to share their knowledge and expertise to help you develop a great strategy. Why Choose Us for Your Solar Hot Water System? Our company was formed in 2012, meaning that we have been at the forefront of an emerging industry for many years now. With this experience, we are able to offer powerful solutions that our competitors are unable to beat. We have also used this time to develop a simple and effective method of working with our customers. Our entire team is capable of executing their particular roles perfectly, meaning that from the initial quote to final installation and maintenance you’ll have a wonderful experience. We are proud to work in our industry. It’s incredibly important to leverage the abundant natural resources that we have available to us in order to reduce the negative impacts that we have on our environment. We help our customers to save money while also living a more sustainable life. We understand that many of our customers are looking to install a solar hot water system Australia can be proud of, and they’re driven by the same values. It’s a pleasure to provide solutions to those people. Our team is also driven by the belief that our customers should not have to break the bank to get a system that works for them and the environment. This is why we make every effort to ensure that our service and products are priced as competitively as possible. If you would like to receive your quote from us today, you can contact our helpful representatives who will provide you with the information you need. We know our products inside and out, and we always work to put our customers first. This means that you’ll find we are communicative, clear and a pleasure to work with in general. In fact, if you’re looking to buy solar hot water system packages from a leading provider, why not contact us today to discuss your needs?